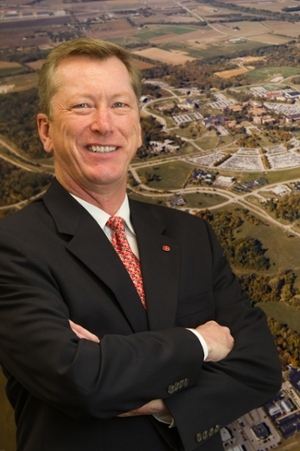 Southern Illinois University Edwardsville Chancellor Randy Pembrook has recommended an extended term for Rich Walker as vice chancellor for administration (VCA). The appointment is contingent upon SIU Board of Trustees approval. Walker has served in many leadership roles in academic and professional organizations, including the SIUE Chapter of the Phi Kappa Phi Honor Society, Leadership St. Louis and the Scott Air Force Base Military Affairs Committee for Leadership Council Southwestern Illinois. In addition, he was recognized with the Carol Kimmel Community Service Award for Faculty and Staff in 2005. In the Edwardsville community, Walker served on the City Council for 16 years and was chair of the finance committee, public services committee, the administrative services committee, task force on technology, Wildey Theatre development committee and represented SIUE on the City’s public safety facilities planning committee. Walker earned a master’s from SIUE and a bachelor’s from Indiana State University. Photo: Rich Walker, SIUE vice chancellor for administration.